Risotto is definitely a dish that has to be made with love and care. For me it is comfort food. Last time I made risotto it was for Sophia my daughter. We both stood and chatted taking it in turns to stir, only slowing or stopping when talk got a little more interesting than making the risotto. I also had a small problem of mid way through cooking that two more places at the table were added so to eek out the risotto I served it with rocket and a little balsamic vinegar. I don’t know why, but I go through phases with risotto – it’s a fantastic way to use up the last little bits of the roast chicken, using the chicken carcass for the stock. I rely on a risotto to help with the glut of courgettes from the garden, or as in this case a large pumpkin that needed eating. I am also prone to being a little fussy with my risotto and there are certain types I really like. Riso Superfino Carnaroli is one of them. I am a bit of a sucker for nice packaging and Riso Superfino Carnaroli certainly ticks that box with its white cotton sack and bright red writing. The downside is I can never bring myself to throw those little bags away after I have used up all the rice. I have a little growing collection of them in my kitchen drawer. I am getting to the point that I need to find a use for them otherwise they are going to have to go because space is getting very tight. Risotto is easy to make, but it doesn’t like being reheated as the rice goes stodgy and is unpleasant. If all the ingredients are prepared before hand it makes the standing and stirring a rather relaxing experience. I tend to let my mind wander to what I am going to cook tomorrow or looking out of the window to see if the dog has disappeared into the vegetable garden which he knows is an out of bounds area. There are no hard and fast rules with what you add to the risotto except it is best cooked and eaten straight away. 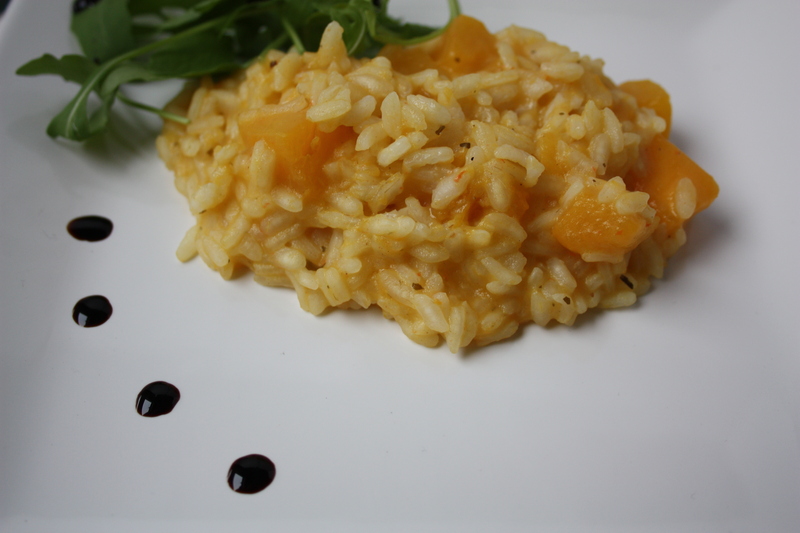 Risotto rice is different from other rices – so if you haven’t got a risotto rice in the cupboard leave it until you do. Finally, as you add the stock remember to keep it simmering as you don’t want to slow down the cooking of the rice. There are two methods of cooking the pumpkin for this recipe either on the top of the stove in a pan with foil or roasted in the oven. I find the top of the stove the quickest. Put the stock in a pan and leave on a slow simmer. You need to keep the stock at roughly the same temperature as the risotto – I sometimes put the stock in a jug and keep heating it in the microwave as I need it. Heat the oil in a large pan then add the onion, turn down the heat so that the onion gently cooks and becomes translucent without browning. While the onion is slowly cooking put the pumpkin in a pan with a knob of butter or oil and some silver foil over the top to act as a loose-fitting lid, this will help the pumpkin to steam and retain its moisture. It cooks fairly quickly, about 10mins – you know when its cooked as you can just put a knife into it. When it is cooked, save some of the pumpkin putting the rest in a blender to puree. Set aside, it will be added later to the risotto. Or roast in the oven with garlic and a little olive oil drizzled over. I find a pan on top of the stove the quickest. When the onion is cooked, add the rice and turn the heat up, keep stirring so all the rice is coated in the oil. The rice should very quickly start to change colour slightly. Now add the white wine, stir slowly until all the wine is absorbed then start to add the stock, a cup at a time. Once added the risotto needs to be stirred. There is no need for frantic stirring, just enough so that the rice doesn’t catch or start to stick to the bottom of the pan. As the rice absorbs all the liquid add some more stock and keep going until the rice is cooked. If you run out of stock and the rice still needs further cooking just add some boiled water. There is not exact timing for risotto – you need to taste as you go along, you will know when it’s cooked because it will taste as you would like to eat it, some like it al dente and others a little softer. Just before the risotto is cooked add the pumpkin chunks and puree, and any further seasoning. As you take the risotto off the heat add a knob of butter and the grated parmesan cheese. Stir, leave for a couple of minutes to stand and then serve. Thank you. Your Nutella Beer Pudding sounds rather wonderful too. 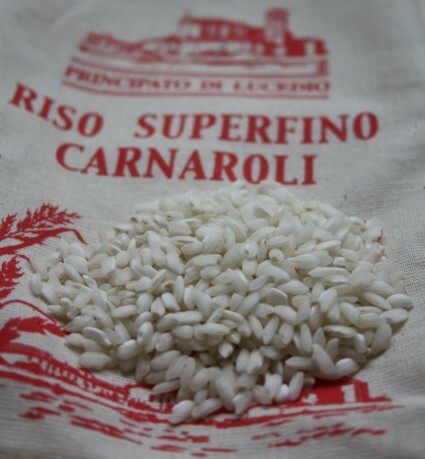 the risotto looks great and Carnaroli rice is just perfect for it. As to the bags, I would wash them very well and filled them up with dry lavender turning them into scented drawer sachets. Thank you Francesca. Your idea of lavender bags is brilliant. Some of my Christmas presents for next year are sorted!! I shall use the lavender in the garden. You got me thinking, I could even unpick 4 or them and join them together fill with oats so that they can be heated up!! What have you started?!!! Your pumpkin risotto sounds delicious, but I have to admit I’m terrified to try it after watching several seasons of Kitchen Nightmares! Thank you Kathleen, I don’t know of Kitchen Nightmares will go and do some research! What a great recipe, Maria, and a great use for pumpkin. It’s also a reminder that I’ve pumpkin in my basement freezer. I’ve pretty much forgotten about it and need to use it up. 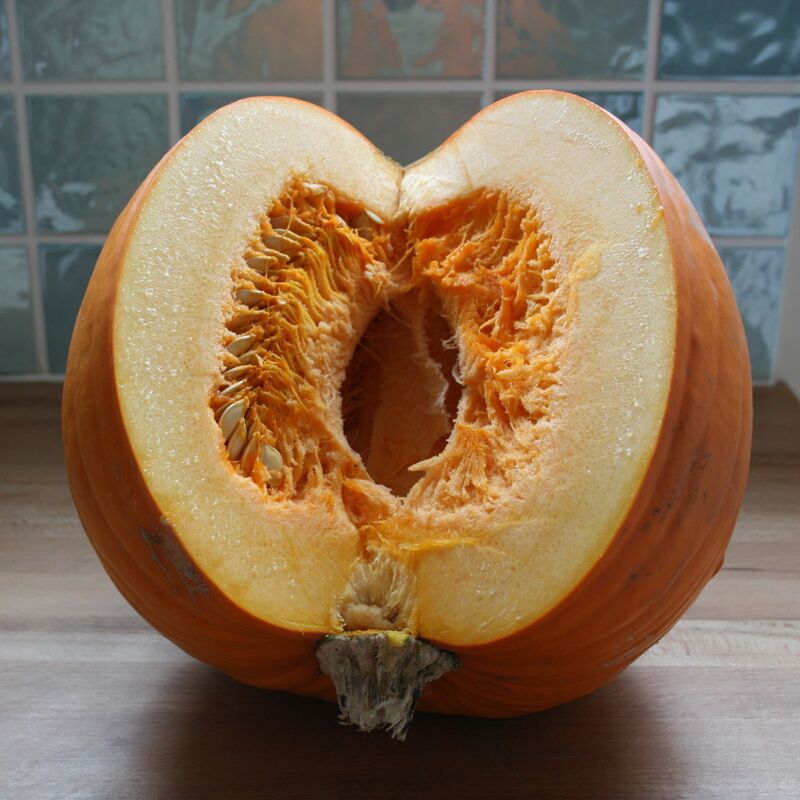 So, thanks for both a great recipe and the nudge to defrost some pumpkin and get cooking! Thank you John. The freezer is something in my kitchen that gets the least use, something I am realising should change. I didn’t even know you could freeze pumpkin. Hi Maria, Just found this and it’s a dish I just love to cook but haven’t for a while. I now know what we’re having for supper tonight. Will try your stove top method for cooking the pumpkin. Sounds genius! Perhaps a little chopped bacon on top to satisfy my carnivore husband. Better get going. Thanks for the Monday night inspiration! The stove top method is so much quicker. Thanks for leaving a comment.